Home School in the Woods is a company that has made a name for itself in the homeschool community by delivering quality, hands-on history studies and supplements for kiddos just itching to learn stuff by doing stuff. I recently had the opportunity to try out and review Colonial Life from the Time Travelers American History series with my creative crew, and they are having a great time with it. Colonial Life contains 25 lessons, with every 5th lesson being a “project day” for finishing up any unfinished projects. 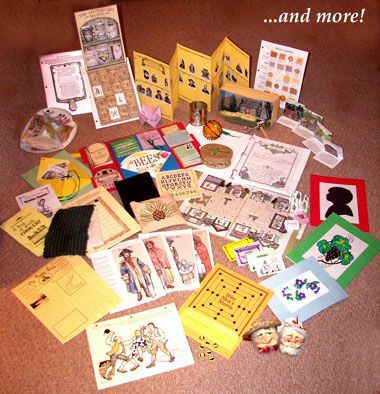 The other 20 lessons each have informational text to read (typically 2-3 pages), followed by instructions for completing various projects including: beautifully detailed paper crafts, recipes, penmanship, science experiments, a newspaper, a diorama, instructions for making various historical crafts, and more. If your kids are always begging you to do more hands-on projects or arts and crafts, Colonial Life schedules that all in for you and provides all your instructions. You just need to shop for the necessary supplies. The entire study can nicely supplement a more in-depth unit on colonial life in a America, or you can use it as as stand-alone (which is what we are doing). If you do all of the lessons, you can expect to spend at least 5 weeks, but our family could easily spend a semester (or longer!) on this study. I’m using Colonial life with my rising 3rd, 6th, and 8th graders and all of them have been fully engaged in the readings and projects. We have been doing averaging two lessons per week, but some of the projects take us more time. In fact, all three of them are currently working on their cross-stitch samplers and have been busily working on them since last week. The key to using this study is to be selective about what you are going to do---there is no way my kiddos could do it all. If we were using this during our regular school year instead of the summer, I would probably drop it back to one lesson a week and add in some additional reading so we would have more time to do the projects alongside our other school work. Since this is meant to be a fun summer study for us, we’ve been spending a lot of time on the crafty bits. Unlike when we used Project Passport World History Study: Ancient Greece (also from Home School in the Woods) where I had each of the do their own paper crafts, they have been doing the paper crafts and lapbook elements as a “team.” We generally select one or two projects per lesson to complete. How about some pictures of that fun? Because that’s the best way to get a handle on what the activities are like. Colonial Life includes patterns to cut historical replicas of colonial stencils from transparency film. I tried to do this using an exacto knife as instructed, but it was a very frustrating and, ultimately, unsuccessful process. It was simply too hard to cut out the little tiny bits accurately without accidentally tearing the film. And I needed stencils for three kids to use---in the end, it made more sense to buy stencils. While the ones we used were not historically accurate, the kids did enjoy using this age old technique for adding attractive, but inexpensive decorations. We did use the included the stencil patterns as coloring pages (another suggested activity). The study includes many paper crafts, some of which will be added to a lapbook at the end. Here are a few examples. We also dressed a colonial woman, a man, and a boy. The instructions actually have you use clear transparency film to make an overlay for each layer of clothing that you can fold over the figure. When we used this method in our Ancient Greece study to dress the ancient Greeks, we had a lot of trouble with the clothing pieces sliding off the film (the double stick tape wouldn’t stay stuck and the glue peeled off). This time we decided to try clear Velcro stick-on dots instead and it seemed to work pretty well. The only drawback was getting them lined up and you need to let them set a bit after sticking them on or they’ll peel off when you try to undo the Velcro. There is a sample pattern, which includes patterns for numbers and letters, but I loved the inclusion of a blank, numbered grid so the kids could do their own creative designs. We really love all the hands-on activities Colonial Life and are looking forward to continuing with it. For shorter studies, check out the Activity-Paks and the Lap-Paks. Plus Home School in the Woods has just unveiled something brand new that’s perfect if you only want to add a few hands-on extras to your curriculum without tackling a whole extra study: A La Carte Projects!